Examines how the millennial genearation is profoundly impacting politics, business, media, and activism. How Millennials are shaping our world, for better and for worse. They've been called trophy kids, entitled, narcissistic, the worst employees in history, and even the dumbest generation. But, argues David D. Burstein, the Millennial Generation's unique blend of civic idealism and savvy pragmatism, combined with its seamless ability to navigate the fast-paced twenty-first-century world, will enable it to overcome the short-term challenges of a deeply divided nation and begin to address our world's long-term challenges. 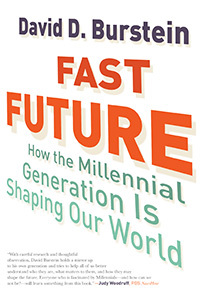 Drawing on extensive interviews with his Millennial peers and on compelling new research, Fast Future reveals the impact and story of the Millennial Generation-in its own words.